A ruthless Spurs side secured their first victory at Old Trafford since late 2014 last night in the Premier League. A second half onslaught from Mauricio Pochettino’s side saw Lucas Moura thrive, with the Brazilian netting a brace. Harry Kane was also on target, as the victory continued Tottenham’s 100% winning record at the start of this season. For the hosts, 2 defeats from 2 has sparked fresh concern from fans regarding the future of manager Jose Mourinho. Pochettino again opted to change his formation, this time into a four at the back system. He decided to keep faith in Hugo Lloris, following his arrest for drink driving. Not only was he selected in goal, but he also retained his captaincy. Davinson Sanchez and Ben Davies were benched as Moussa Dembele and Danny Rose were brought in. The first half was an exciting affair, even though clear goalscoring opportunities were limited. The biggest chance fell to Romelu Lukaku, but the Belgian missed. Rose under hit a carelessly weak back pass which was intercepted by Lukaku, he rounded Lloris and had an open goal from a wide right angle in the penalty area. However, he spared Rose’s blushes, as he hit it wide of the left-hand post. Tottenham had a genuine claim for a penalty as Lucas powerfully drove through the Manchester United defence, but was hauled over by Phil Jones. Craig Pawson decided that there wasn’t enough contact. The second half began, as Spurs took the lead in the 50th minute. Kieran Trippier whipped in a curling corner from the right, towards the back post. 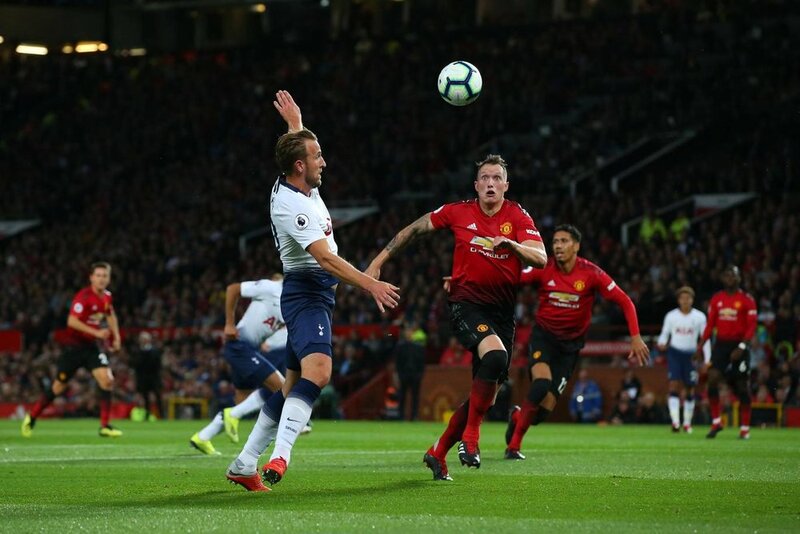 Kane got away from Jones to guide a clinical header into the right-hand corner, leaving David De Gea rooted to the spot. There was drama as United came close at one end, but Spurs countered themselves and earned a two-goal lead. Two minutes after the goal, Lukaku nicked the ball off Dembele, but saw his shot from a tight left-hand angle be saved by Lloris. At the other end, Trippier played a fine ball down the right which evaded the Red Devil’s offside trap, towards a running Christian Eriksen. The Dane drilled the ball into a central position in the penalty area towards Lucas, who connected cleanly to fire the ball into the bottom left corner. He followed up his first League goal last week at Wembley with another, and Spurs were in a fantastic position. United spurned an opportunity to half the deficit, as Lukaku nodded a ball from Alexis Sanchez towards Jesse Lingard, but Alderweireld put him off. Spurs then missed two golden opportunities to finish the hosts off. Victor Lindelof played a destructive back pass which was pounced upon by Dele Alli. However, similarly to Rose, he wasn’t punished as Alli looked to cut back onto his stronger right foot, but De Gea recovered. Kane should have also made it three as he drifted to the back post on another Trippier corner, but he nodded the ball wide from close range. Mourinho’s side then missed a few half chances, but Tottenham made their dominance count as they earned a third to kill the game off in the 84th minute. Kane and Lucas combined as the Englishman expertly picked out his colleague in a central position, he then attacked the final third with pace and forced his way through Chris Smalling to give himself another chance. He scored his third goal in three Premier League games as he struck the ball accurately into the bottom left hand corner, to send Spurs fans into wild celebration. The defeat for United exacerbated their own situation following their loss at Brighton last week, and already fans are speculating regarding the future of Mourinho. He will take his side to Turf Moor next, looking to steady the ship. The incredible win earned only a third ever Premier League win at Old Trafford for Spurs, and the first since early 2014. The club made a real statement that they can compete despite not making any signings, compounded with three wins from three in the league. They face Watford at Vicarage Road next, a top of the table clash this early in the season.